The Gulf of Naples is enhanced by the presence of several islands some of which famous throughout the world for their beauty, their charming landscapes and the natural characteristics. 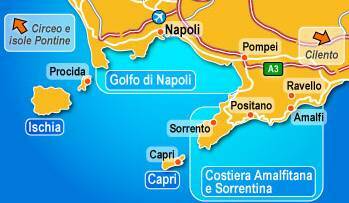 The Campanian Archipelago, also called Neapolitan Archipelago comprises 5 islands: The main islands in order of size, are: Ischia, divided into 6 municipalities: Ischia, Forio, Lacco Ameno, Forio, Serrara Fontana and Barano d'Ischia; Capri, divided into the towns of Capri and Anacapri; Procida, in the municipality of the same name which also include the tiny island of Vivara, and Nisida in the municipality of Naples. Nisida is a volcanic islet of the Flegrean Islands archipelago. 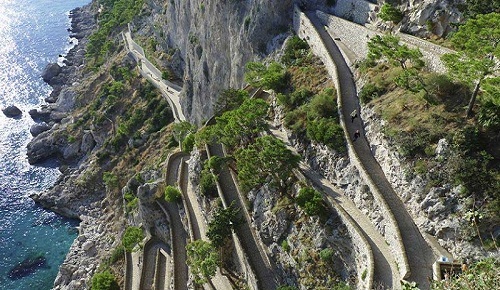 It lies at a very short distance from Cape Posillipo, just north of Naples; it is now connected to the mainland by a stone bridge. The islet is almost circular, with a flooded crater forming the bay of Porto Paone on the southwest coast. Other minor islands include: The island of Ischia Aragonese Castle outside of Ischia Ponte, the small island of St. Martino in the municipality of Monte di Procida, the small island of Gaiola now included in the submerged Gaiola park, the islet of Megaride, on which is located the Castel dell 'Ovo, Naples, the islet Rovigliano (formerly Revigliano), near the mouth of the Sarno River, between the towns of Torre Annunziata and Castellammare di Stabia, Capri's famous Three Faraglioni (ground, middle, outside), and then the rock of Monacone a short distance from them, the three islands of Li Galli (Gallo lungo, Castelluccia, Rotonda), on the Amalfi Coast and the rock of Vetara (also called Vivaro) located 3 km west of Li Galli. 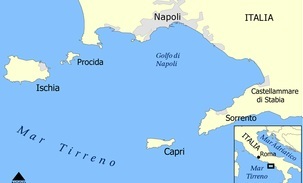 The ancient name of this archipelago was Parthenopaean Islands, and it was originally extended to the Pontine Islands. Nowadays, these islands are considered part of a different archipelago. While the island of Capri, south of Naples, is a rocky promontory once connected to the nearby peninsula of Sorrento, the islands of Ischia and Procida have their genesis to the intense volcanic activity of the Phlegraean Fields, west of the city. 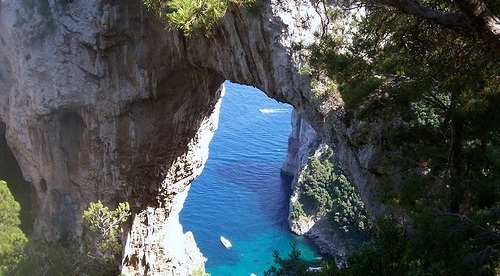 One of the most famous is the island of Capri, a reef limestone. 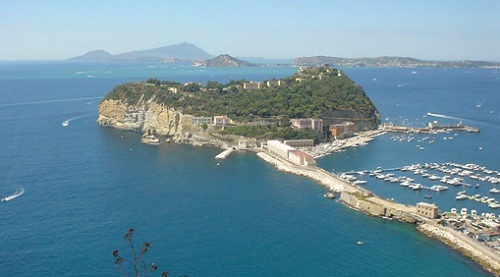 In Paleolithic time the island was in fact connected to the Sorrento peninsula, which broke away in the subsequent periods due to movements of the earth's crust and today is about 5 km from the mainland. The calcareous nature of the island is reflected in the steep walls of the Dolomites, in the many fascinating natural cavities and in the cusps of the Faraglioni, which form an appendix. 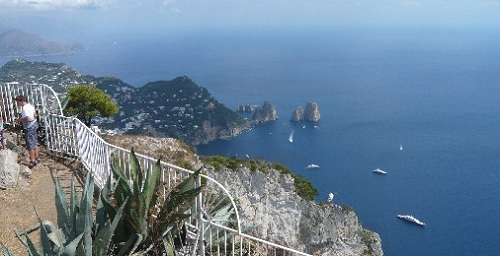 The island is divided into two towns, Capri and Anacapri. The main resource of the island is tourism, which is based on both the historic richness of the landscapes and excellent bathing facilities. On a hill lie the ruins of Villa Jovis, a splendid example of a Roman villa of the imperial age, which, along the Baths of Tiberio represent the remnants of the distant past greek-roman. An important feature of the site of Villa Jovis was the lighthouse, used to communicate with Sorrento and Capo Miseno where the imperial fleet was docked. Today, on the highest terrace of Villa Jovis there is a little chapel with statue of Saint Maria del Soccorso. Among the most visited tourist destinations of the island are the Faraglioni, the Natural Arch, once the entrance to a cave deep in the mountain, the beach of Marina Piccola and the fourteenth-century Certosa di San Giacomo. In addition to becoming a symbol of the island, the Faraglioni (below)rocks undoubtedly represent one of the most enchanting places on Capri, a natural monument created by three rock formations which were once a single extension of the Tragara promontory. The Natural Arch is located approximately 30 minutes away from the village center, at the end of the Via Matermania. This monument created by nature, is one of the most fascinating on the island. The history of the formation of the Natural Arch can be traced via the various signs of erosion which have occurred over the centuries: in ancient times there would have been a great cavity, initially underground, which surfaced as a consequence of a series of landslides and was modelled by subsequent posterior and anterior erosion to "create" this unique monument, now a major tourist attraction. Dating back to 1371, the San Giacomo Charterhouse sits in the valley called Sama or Lama, on the southern side of the island, on land donated by Queen Giovanna 1st of Angiò to Count Giacomo Arcucci who built the edifice dedicated to San Giacomo there. The building was used as a prison and military arsenal before being handed over to the Ministry of Culture in 1936. The building also houses a museum where a number of archaeological exhibits including the two statues found in the Blue Grotto are displayed. The panoramic Via Krupp, from Marina Piccola leading up to the August's Garden, conceived by the German industrialist A.F. Krupp in 1902. 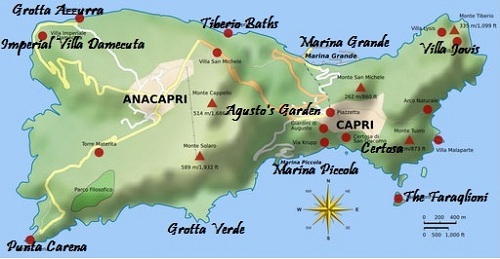 Anacapri is instead on Mount Solaro, reached by chair lift or along La Scala Fenicia (The Phoenician Steps) from here you can enjoy beautiful panoramic perspectives on the island, and the Gulf of Sorrento. The cave was already known to the Romans who used it as a maritime Nympheum of the Villa Gradola, positioned above the cavity; a use to which two statues found on the floor of the cave refigure Poseidon and Triton and now housed in the museum of the Charterhouse of St Giacomo bare witness. Inside the Blue Cave, besides the display of blue light created by the water, there is an underground network of various cavities: the largest and most easily visible is the "Duomo Azzurro", a cavity measuring 60 meters in length in which one finds a platform built by the Romans, to the right of which there is the "Galleria dei Pilastri" and the "Sala dei Nomi", whilst to the left there are a series of passageways which most probably communicate with the nearby Guarracini cave. 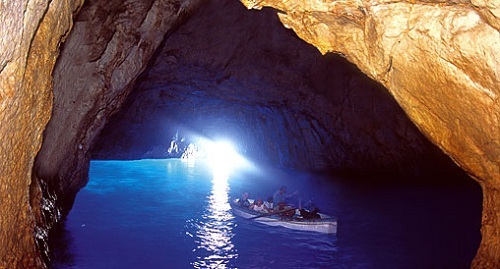 The Blue Cave can be reached both by sea from the port of Capri or by land. Visitors can reach Villa Damecuta by bus or choose to go by foot, following a pleasant route from the center of Anacapri along via Pagliaro, and via Tuoro. This Roman residence was one of the twelve palaces believed to have been built on the island according to the wishes of the Emperor Tiberius. In comparison with other imperial villas, there is very little information available concerning the construction of Damecuta. Shopping : Sandali capresi by Amedeo Canfora, the sandals which have fascinated Jackie Kennedy, a sandal as simple and chic as the female style icon who inspired it.